Pour toute la famille, calme, reposant Home Away From Home Capacité 6/7. Nouvellement rénové la maison, très confortable, calme, reposant. Belle région senic, à proximité du Colorado Wolf et Wildlife Center, Cripple Creek, Woodland Park, Eleven Mile Resevoir, Tarryall Resevior, Pôle Nord, Pikes Peak Highway. Randonnée pédestre, VTT, pêche, shopping canotage. Regarder le cerf et de la faune ou en étoile regard. 3 grandes chambres, 2 grands lits King size, 1 lit queen, une salle de bain complète et un bain 3/4. Cuisine mise à jour de Nice avec une grande nouvelle réfrigérateur, cuisinière à gaz, four micro-ondes, machine à café Kuerig, comptoirs en granit, cour clôturée avec patio et pont avant. Machine à laver et sèche-linge. Une salle de bain complète avec baignoire, 1 3/4 salle de bain avec douche. Being the “complainer” that I am, here it goes... Nothing, nothing st all. Perfect!!! From cleanliness, spacious, having everything you need to the proximities as well as road crews clearing the roads. Thanks for the memories, loved it and highly recommend. Thanks Daniel, so glad you had a great time. Hope to hear from you again for future stays. 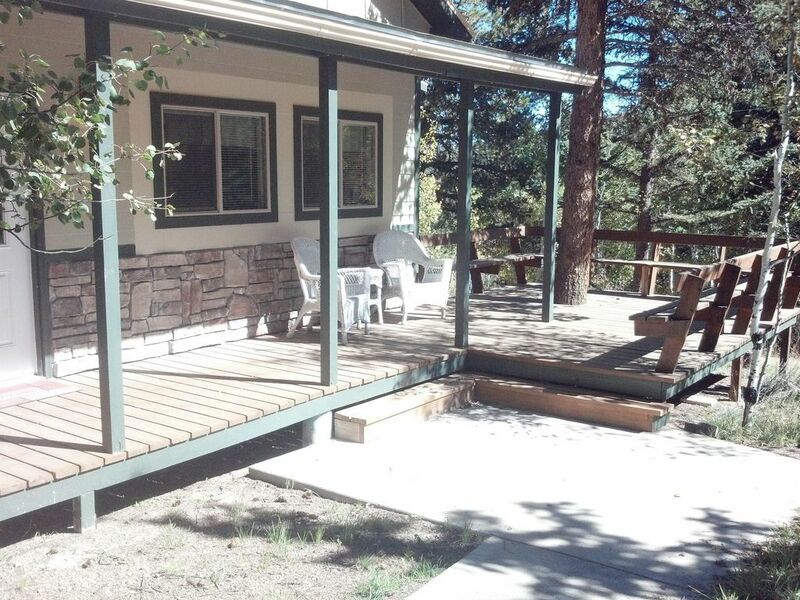 This cabin was clean and had an updated kitchen with new wood flooring with all the items we needed. Comfortable bed and nicely decorated. We enjoyed the wildlife in the area as several deer came up close to the cabin on a regular basis. Amazing property in the heart of everything! This was our first time using VRBO and based on this experience - we will do it again! Wonderful property - homey, quiet, comfortable and very relaxing. Perfect backyard for dogs to run and play. So many deer to see. Location of property made getting around great! Dawn and Keith have decorated this property perfectly and made everything comfortable. Kitchen amenities were perfect - the keurig and toaster were used daily. Very convenient to have the washer and dryer, too. Will definitely consider this property again! We really enjoyed our stay. The house was comfortable and quiet and roomy. The fenced in yard was SO nice! We have stayed in pet friendly places before, and you can usually tell a difference when a place is allows pets. Not this house. If we didn't know it was pet friendly we would not have been able to tell. It was very clean, which is important to us. It is a ways out of town, a little less than 10 minutes to Divide, but we didn't mind. We like being away from the hustle and bustle. It's a great place and we would definitely stay there again. Thank you Tyler. We appreciate how well you kept our home while you there and hope you keep us in mind if you are in the area again. Beautiful mountain home! We go to Colorado every year to spend time with the grandchildren. We always stayed in a hotel, but this year we rented this home and the kids came and stayed with us. Best trip ever!! This is a beautiful mountain home convenient to things to do in the Colorado Springs area but secluded enough to enjoy family time with a back yard bbq. I have rented many condos and homes over the years and I have to definitely put this in the top few percent. Dawn is easy to work with and extremely accommodating. Her home is stocked with anything you would want or need. Hers is the only rental I have ever stayed in that even goes so far as to supply flour, sugar, salt, and pepper (staples.) I would 100% recommend this lovely Colorado mountain home. Hopefully when we are ready to head west next summer her home will be available. Thank you so much. I'm so glad you enjoyed our home. Hope to see you next year. This is a very nice cabin with a good kitchen and big, open living room. Everything is kept up well and is clean and cozy. The owners were easy to work with and very nice. The only thing we found lacking was wifi. I know some people go to the woods to escape connecting with the outside world, but we would have benefited from internet access. Thank you so much i will look into Wi-Fi. Près de Cripple Creek, Woodland Park, Divid, Eleven Mile réservoir, Terryall réservoir, Pikes Peak, Pôle Nord, Cave of the Winds.